Lena Dunham has been posting lot's of teasers on social media in anticipation of the official launch of her newsletter, Lenny. But by far the most exciting — and the most adorable, I may add — is the proof that Dunham interviewed Hillary Clinton for Lenny via her latest Instagram post. And let's just say they both look gorgeous and so cute with their outfits semi-matching. I'm sure the interview revolved around Dunham asking Clinton about the newsletter's major themes of feminism, health, politics, and style. Since Clinton is a democratic representative running for president, and Dunham is an outspoken activist and feminist, I expect that the interview is both enlightening and informative, all while being accessible and available to women online. The interview itself goes live on the newsletter next Tuesday, Sept. 29. But until then, I'm sure we'll see more teasers, from photos to videos, being posted on both Lenny's social media pages as well as Dunham's. While I'm eager to hear all the questions Dunham asked Hillary and watch the interview myself, I'll just have to keep distracted in the meantime. Which won't exactly be difficult seeing as how awesome the two already look in this Instagram photo from Dunham's page. Dunham looks very pretty in a black and white gingham dress with a structured bodice and a wide skirt. Her bright blue nails even match Clinton's royal blue suit! Clinton is naturally killing it in a signature pantsuit. While they're not wearing matching ensembles exactly, the color combination of the black, white, and blue makes me want to believe that they planned their outfits together. They certainly make for an amazing color scheme, especially come fall. We can all appreciate a good black coat or jeans, but sometimes throwing in a bright blue color with a basic black and white combination is refreshing, stylish, and an easy way to update any ensemble. The fact that these two women look so good together is hardly surprising. Both Clinton and Dunham are in the public eye supporting women's rights and equality, are outspoken in politics, and are amazingly accomplished in their respective fields. While I'm sure their social views pretty much align with each other, I do know for sure that their individual styles do. This isn't the first time these two have somehow ended up coordinating, even if they were no where near one another. Believe it or not, Clinton and Dunham are aligned by more than just viewpoints. Here are seven times when the two matched each other. Hey — great minds think alike! Yellow isn't necessarily a traditional color, but Clinton's suit is on fleek. And Dunham knows it's a perfect shade for a blouse paired with a blazer. Throwback to Clinton in 1983 when she wore a silk shirt. Dunham wore something similar in a light blue tone instead of pink. Pink for Clinton means a perfectly bright suit. 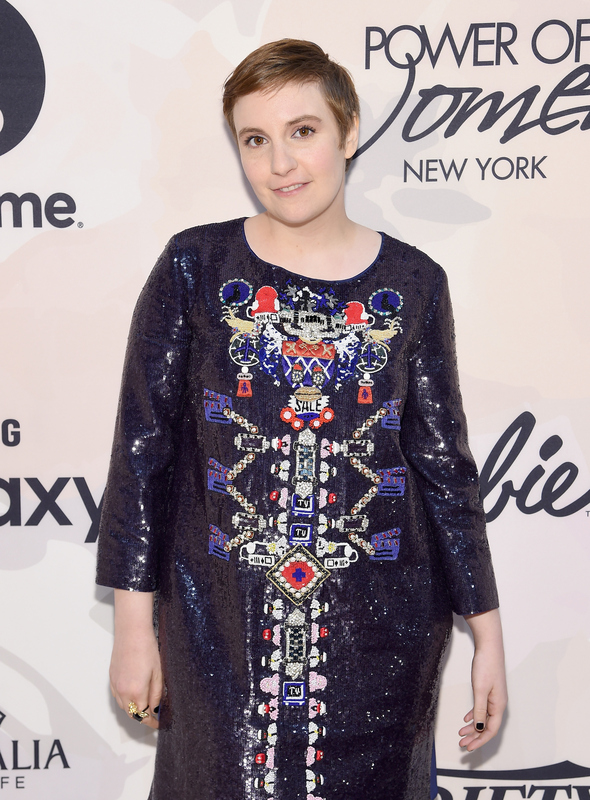 For Dunham, it's a dress with long sleeves. A tailored blouse for Clinton and a chic tank top for Dunham. Don't both look great in a dark green shade? Killing it in red, Clinton. And for Dunham? A red flowing dress with ruffles and stripes is the equivalent. Clinton's classy navy blouse is tailored and pristine. Dunham puts a modern take on her navy with some satin black stripes. And that green hair is also flawless! Ultimately, they're a match made in style heaven.